Sam spent this evening with our dishwasher, which had previously been grinding loudly and leaking gunk before he performed his handyman magic to it. Now it runs as good as new. Sam informs me that this leaves the fridge as the only major appliance in our house that he hasn't had to fix. That's probably because we bought a new fridge when we bought the house! Everything else is old, old old... and running on Prowess of Sam. 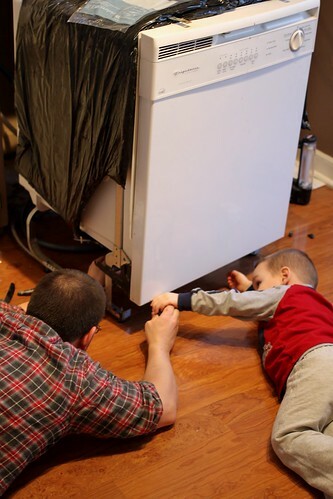 I'm so thankful for my handyman (and his handy-helper) !